Jazz singer, Sarah Vaughan is one of the most notable vocalists of the 20th century. But she wasn’t known for her vocal talent growing up. KBCS’s Yuko Kodama interviews local jazz historian and writer, Elaine Hayes. Part 1 – Find out how Sassy got her groove in the 1920’s. Part 2 – Explores the world of Bebop, and find out why Sarah is referred to as the “Queen of Bebop”. Part 3 – We look at how she sang the Lord’s prayer to set a tone of community and of resistance in her performances. 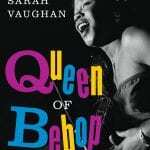 Hayes’s new book is titled Queen of Bebop: The Musical Lives of Sarah Vaughan.